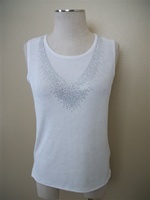 Tank top with rhinestone trim. Coordinates include pants, skirts, gauchos and jackets. Made in USA. 90% acetate/10% spandex. Hand or machine wash in cold water. Dry flat. No iron.